In the depths of December, the British winter can seem endless. Getting up for work in the pitch black and returning home in similar conditions can be somewhat depressing. True, it’s not as cold as other countries but the rain and gloom can make us long to hibernate until the spring arrives. Sadly, humans aren’t hedgehogs and we have to get up and get on with things and this includes looking after those things in life we care about as well as ourselves. Let’s be honest there isn’t a great deal of decent grass around during the winter, so you will need to supplement your horse’s grazing with hay to deliver the required nutrients. You may also want to consider a concentrate feed that could provide more energy for your animal. 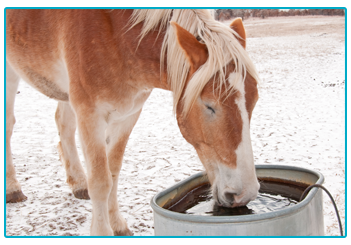 Where water is concerned, you need to be very careful that your horse’s water source doesn’t freeze over. Hydration is just as important during the winter months and frozen water increases the risk of problems such as impaction colic. This isn’t just about stable management, you need to consider all of the environments that your horse is likely to be in. Of course, it’s very important that your stable is warm, dry and well-ventilated. Without the correct ventilation, a stuffy stable can soon cause a build-up of ammonia from the manure, potentially causing respiratory problems. Try and minimise damage to your field or pasture. Your horse’s hooves can quickly churn up the mud and you may encounter issues such as mud fever or abscesses. Look at drainage, and laying down straw or matting in problematic areas. the countryside and at night. 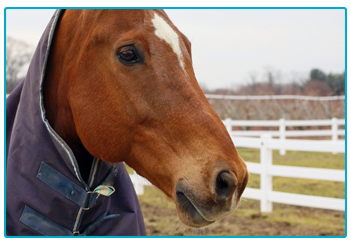 You need to make sure your horse stays warm but also that they don’t overheat. Horses naturally grow a thicker, coarser hair during the colder months, so beware of over-grooming as it can thin the coat out. When looking at a horse rug for your animal, think about the suitability. A heavy weight rug may be necessary when your horse is out in the pasture, while even in the stable, a light weight rug may be required. Be careful you don’t over-rug, check your horse isn’t overheating, and remove the rug every day to allow the body to breathe. Just because it is cold outside doesn’t mean that your horse doesn’t require the same amount of exercise. Longer time spent in the stable and the natural build-up of fat stores means it can be easy for your horse to get out of shape in the winter. Turn them out as much as possible, depending on the conditions. As well as this, the fairly mild winters in Britain mean that you can ride out on your horse more than you might think. If weather conditions don’t permit, then you could always look at longeing exercises to keep your horse in shape. Although conditions may be more pleasant, you still need to be aware of the potential hazards should you choose to ride out during the winter. 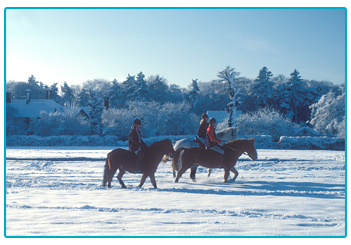 Make sure that both you and your horse are dressed warmly in waterproof clothing. Any moisture on the ground can turn quickly to ice that isn’t immediately visible, so stay vigilant. The conditions may be a lot windier and it goes without saying that the nights draw in a lot earlier, high visibility clothing for you and the horse is essential. Life is a playground and we want to share some of the best games with our horses. Visit The Insurance Emporium today and find out whether we can help you to protect your adventures.